Hardened V face to retain accuracy. Switching On/ Off from side by a knob. Made with special profile for holding specific diameter of boring bars. Also available with entended lever with fixture. Useful for setting boring bars in machine tools. 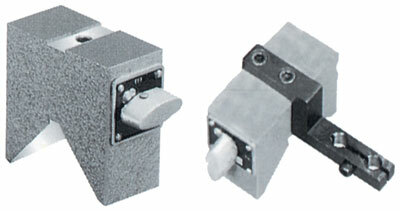 With magnetic power it can be directly placed on boring spindle at any conveneint position. Can hold from V face and from sides.